Iris and Mort November are active in the Cleveland community. Get to know us and our stories on the November Philanthropy blog! Macdonald Women’s Hospital holds dedication for "Where Hope is Born"
We're thrilled to see a new Hector Vega piece finally dedicated at Macdonald Women's Hospital. "Where Hope is Born" is a beautiful reminder of the women and children we've dedicated our lives to supporting. Iris recalled her reaction when she first saw the completed statue. “I couldn’t believe how beautiful it was and when I saw my name and Mort’s on the statue, I cried,” she said. 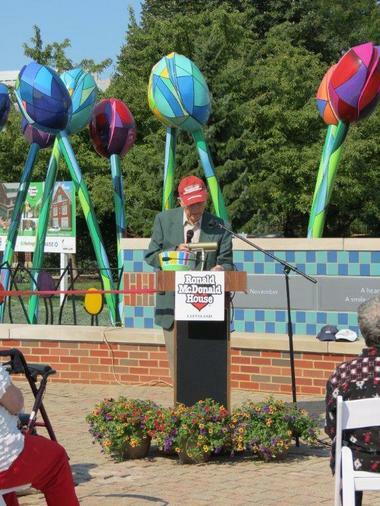 Remembering Mort and celebrating his life was a major part of the dedication. Without his willingness to give to the community, this would not have happened. 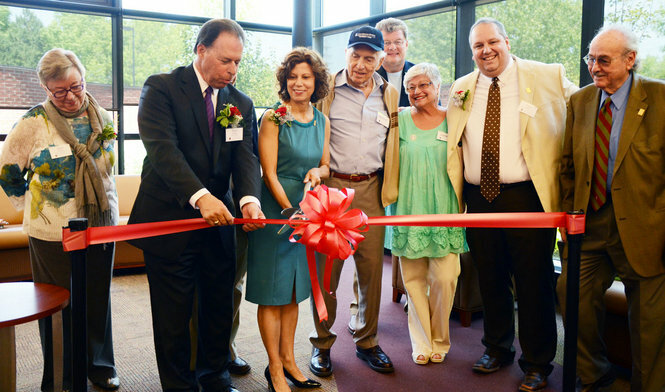 This week a wonderful story crossed our screens courtesy of Cleveland Business, as the journal writes of the opening of the new health center in Middleburg Heights: The November Family Health Center. The look and feel of MetroHealth's new jewel — officially named the Middleburg Heights November Family Health Center — is a far cry from that of the health system's aging main campus. The new building is strewn with natural light, warm colors and artwork by local artists — design concepts rooted in the idea of creating a calming environment for patients. Head over to crainscleveland.com for the rest of the story. A kind message from Harold Grinspoon thanking Mort & Iris November for their contributions to PJ Library. Thank you Harold! The Novembers are thrilled to partner once again with the Cleveland Clinic through at $1 million endowed chair in the Lerner Research Institute: The Mort and Iris November Distinguished Chair in Innovative Breast Cancer Research. 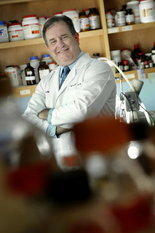 Immunologist Vincent Tuohy is the chair's beneficiary, a researcher who's work caught Mrs. November's eye last April. Money from the endowment's investments won't directly be used to pay for clinical trials, but it will help Tuohy sustain his six-person laboratory, which also is working on preventive vaccines for ovarian and prostate cancers. Tuohy said he would like to hire more postdoctoral researchers to work on new projects. "I feel the momentum is growing," he said of interest in the breast cancer vaccine. "I feel that the resistance in the research community . . . is weakening." Special thanks to Margaret Bernstein for her wonderful piece today at Cleveland.com celebrating Mort's birthday. At 86 years, Mort is as grateful as he's ever been to serve and support our great community. With today's dedication of "Flowers on the Plaze" to the Ronald McDonald House, we're thrilled to be able to continue that tradition. In case you didn't realize it, your town has been greatly spruced up thanks to Mort November and his wife Iris. They have improved the local landscape from east to west, by donating funds to build gardens, libraries, hospital wings, theaters and public art installations. But they outdid themselves this week, unveiling a giant spray of colorful tulip sculptures at Ronald McDonald House on Euclid Avenue that's already bringing smiles to the faces of sick kids and sparking a can't-help-it jolt of joy for us grumpy motorists and RTA riders heading to work. Read more of Margaret's beautiful piece at cleveland.com. Mort and Iris were on hand for the grand reopening of the renovated Beachwood library, celebrating with a joyous community and an endless supply of ice cream! There is a teen and children area, as well as a story time area, which was funded by Mort and Iris November, in celebration of Mort's daughter Debra Ann November. "Our daughter was 24 when she died. It's hard to believe she would have been a grandmother today," Mort November said. "We dedicated the story book room and the children and teen area to Debra because she loved children," Iris said. "The mission statement for the Phyllis and Debra Ann November Children's Fund is 'enchanting the lives of children,' so this is what they would have wanted." Read more about the event at cleveland.com/sun. The Novembers continued their philanthropic commitment to Cuyahoga County this month with their largest single gift to date: $1.5 million to MetroHealth Medical Center. 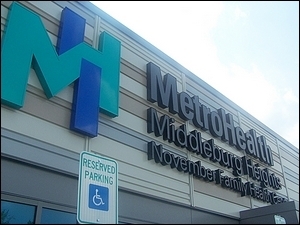 The newest MetroHealth Center will be named the MetroHealth Middleburg Heights November Family Health Center. "As lifelong Clevelanders, we believe in the mission of MetroHealth—a challenging mission to deliver exceptional care to all—which has not wavered over the past 175 years," Mort November said. "Iris and I consider this gift an endorsement of MetroHealth's growth and are proud to support (its) extension of health services to more suburbs and more residents of Cuyahoga County." The new center is expected to open in 2013. Read more at the Cleveland Jewish News. We're thrilled to announce another donation to our dear friends at the Cleveland Clinic, establishing the November Pediatric Airway and Pulmonary Mechanics Lab. It's a state-of-the-art facility designed to serve our youngest community members and clinic patients, in addition to serving as a world-class training facility for medical professionals. Equipped with an ICU ventilator, an artificial lung, a high-fidelity bronchoscopy simulator, and child-sized high-fidelity mannequins, the lab will further a curriculum that spans the fundamental skills of airway management to the more complex competencies required for diagnosis, decision making and team leadership. Read more about the facility at Cleveland Jewish News. Read more about the donation in the Beachwood Patch. But it’s not enough for the Novembers to give their money to help others: They are experts at convincing others to give, too — "accessories" to their own gifts. Mort and Iris November have been involved in philanthropy for over 20 years, with a focus on children and their needs. Their philanthropy helped name the Debra Ann November pavilion at the Mandel JCC's Camp Wise and Debra Ann November KidSpace room at the Mandel JCC. In addition, over 15 projects have been completed, including the Debra Ann November Autism Wing at the Cleveland Clinic, The Debra Ann November Learning Center in the East Cleveland Public Library, the silo Theater at the CWRU Farm Site and more! Come meet Iris and Mort November 1:30 PM at Mandel JCC to learn about their work and their book, "The Fine Art of Schnorring". Free and open to the public. Limited seating, reservations required, desert reception to follow. Thanks to the generosity of philanthropists Mort and Iris November and the talent of local artist Hector Vega, brilliant flowers in bloom will always welcome children and families to MetroHealth, one of the largest health care providers in Northeast Ohio. The sculpture, titled “Grow Love”, features vibrant flowers shaped as hearts. It was dedicated at 6:15 p.m. Dec. 10, 2010 in a celebration of the donors. The sculpture is located at the entrance of the Women & Children’s Pavilion at MetroHealth. This is the first donation on the west side of Cleveland for the Novembers. The couple has long supported philanthropic causes for children, in honor of Mort’s daughter Debra Ann. The Novembers were inspired to make their donation after learning about MetroHealth’s unique and nationally recognized programs for children. "They hope children who are entering the hospital, who are frightened — and parents who are frightened — will walk up to this flower garden and it will make them smile,” said Iris November.